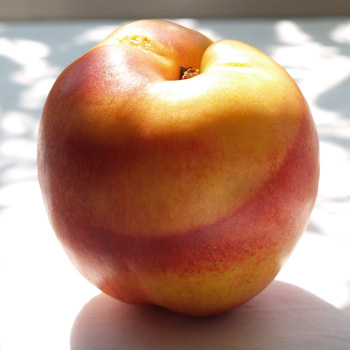 Nectarines are related to peaches, part of the rose family. In fact, they are very much like a hairless peach. They are not a cross between a peach and a plum, as some people think. 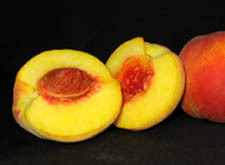 In fact, some botanists now suspect that peaches may have been a cross between Nectarines and almonds. Nectarines are firmer, sweeter and juicier than Peaches. They are round, with yellow skin that has a red flush to it. Inside, they have yellow flesh surrounding a large pit or stone in the middle. A more important distinction to consumers than the various varieties are the two main categories of Nectarines: clingstones, whose flesh is hard to separate from the pit, and freestones, whose flesh detaches easily from the pit. When buying fresh Nectarines, look for ones that are firm, but not hard — truly hard ones won’t ripen much for you at home. Avoid greenish ones, hard ones, or ones that are bruised or squishy. Nectarines are usually just eaten out of hand, though they can be poached or used in relishes and chutneys. Wash under cold running water. No peeling is required. Once cut open, the flesh will brown easily. If you are using Nectarine pieces in a fruit salad or as an uncooked garnish on a dessert, dip them first in lemon juice or acidulated water. You can swap peaches and nectarines for each other. You can ripen Nectarines at home in terms of softness and juiciness, though once picked from the tree they will not get any sweeter, nor can you ripen greenish ones at all once they have been picked. If the fruit needs softening, place in a paper bag for 2 to 3 days at room temperature. Never place it in the fridge if the fruit is still hard, as it will never soften and just go bad. Once it has been softened, store in fridge for 3 to 5 days. Nectarines probably originated in China, reaching Europe via the Middle East. They were not really recorded before the year 0. They were grown in the Roman Empire, but the Romans just viewed them as a variety of peach. There were 6 varieties in England by the 1620s. They were first recorded in America in Virginia in 1720. The flesh of Nectarines was white up until the 1940s, and they were much smaller as well. The problem with Nectarines was that they shipped poorly because they bruised easily. In 1942, the first of the truly shippable varieties, the “Le Grande” was developed, and it had yellow flesh. Most of today’s varieties were developed from “Le Grande”. Growers, though, are revisiting the white varieties, because they are sweeter than the yellow varieties now very common, and white ones that will ship better are being developed. It was the botanist Luther Burbank who first speculated that Nectarines may have evolved before peaches.